Annual inspections average around $300 to $500 per year for both companies. However, Orkin tends to be more expensive than Terminix. If you already have a pest infestation, expect to pay $450 to $2,000 or more per year for monthly or quarterly pest control treatments. Pests destroy homes and buildings - termites alone cause more than $5 billion in damage each year, according to the National Pest Management Association. Pests such as insects and rodents also carry disease, contaminate food supplies and generally make our homes and businesses less pleasant places to be. Perhaps that's why pest control has grown to a $6.5 billion annual industry. If you have a pest problem, or you're trying to prevent one, chances are you're familiar with the names Orkin and Terminix - two of the oldest and most respected pest control companies in the business. Both offer preventative and treatment options for residential or commercial properties to keep unwanted creatures at bay. Orkin has been in business for more than 100 years. The company was founded in 1901, when a man named Otto Orkin began selling rat poison door-to-door in Pennsylvania. Eventually, he branched out to eliminating pests such as termites, cockroaches and bedbugs. By the 1920s, Orkin had expanded to other cities and established headquarters in Atlanta. In the 1950s, the company launched the wildly successful Orkin Man campaign, which in use and widely known today. Today, Orkin is one of the largest pest control companies in the United States, creating customized plans to eliminate pests including termites, mice, ants, flies, mosquitos, fleas, spiders, rats, ticks, beetles and weevils. No two treatments are alike. Orkin also strives to use the treatment with the least harmful impact on the environment, choosing non-chemical options when possible. Orkin offers a money-back guarantee for customers who are not satisfied with the work. And if pests return between treatments, the company will return for an additional treatment at no extra charge. Orkin's reviews are less favorable than Terminix. Consumer Affiars rates them 1.7 out of 5 stars. The biggest complaint was unprofessional customer service (cancelled appointments or showing up without calling). 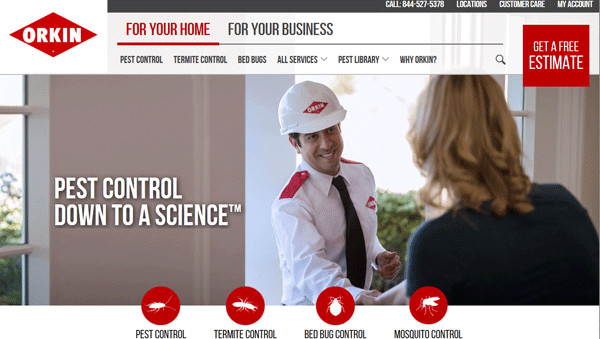 Others complained that Orkin employees used fear to make a sale. Terminix is the largest pest control company in the world, operating in 45 states and 14 countries. The company was founded in 1927 by E.L. Bruce, owner of flooring company Memphis, Tennessee by the same name. Bruce, wanting to protect the company's hardwood floors from termites, founded the Bruce-Terminix Research Laboratory. Just five years later, senior chemist Frank Lyons created the first insecticide for termites. Eventually, the company began franchising. And by 1957, franchisees were offering residential and commercial services. Like Orkin, Terminix is equipped to deal with all kinds of pests, including termites, ants, cockroaches, spiders, flies, bees, beetles and weevils. The company guarantees a solution within 24 hours of your initial call, offers a money-back guarantee if you're not satisfied with the work, and promises a free return visit if the pest problem persists between regular visits. The Terminix approach to pest control is threefold. The company treats the inside of the home, including kitchens, bathrooms, garages, exterior doors, fireplaces and plumbing. Then exterminators treat the perimeter, baiting and trapping pests, and applying chemicals to cracks and crevices. Finally, they tackle outlying areas such as trash storage areas, storage buildings, mulch beds, and pool pumps and filters. Online reviews are very favorable for Terminix. According to Consumer Affairs, Terminix maintains a 4.5 out of 5 stars. Customers love their 100% satisfaction guarantee as well as their extensive online blog. The biggest complaint is that Terminix does not service Alaska, Montana, and North Dakota. Prices vary from region to region and from one franchise to another. Prices also vary based upon the type of service you select. Annual inspection and protection plans run anywhere from $300 to $500 per year. These are for homeowners who have NOT yet discovered an infestation. The service covers annual inspections, as well as the cost of pest control services if a future inspection uncovers a problem. Consider it like pest insurance. If you do have an infestation, the cost is much higher. Expect to spend anywhere from about $450 to $2,000 or more per year for monthly or quarterly pest control treatments, depending on the pervasiveness of the problem. 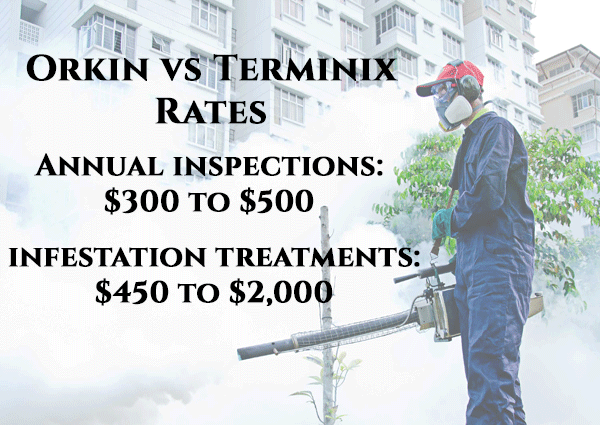 Orkin is usually a little bit more expensive than Terminix, although some consumers say the treatment is more thorough. However, keep in mind that customer experiences vary from one region of the country to another because franchises are individually owned. You should do some background research on your local franchise for the most accurate information. Terminix tends to have higher online reviews than Orkin. Orkin's services cost a little more than Terminix. Both pest control companies offer free initial inspections and both guarantee their work. They are also both franchised companies so quality may vary by location. 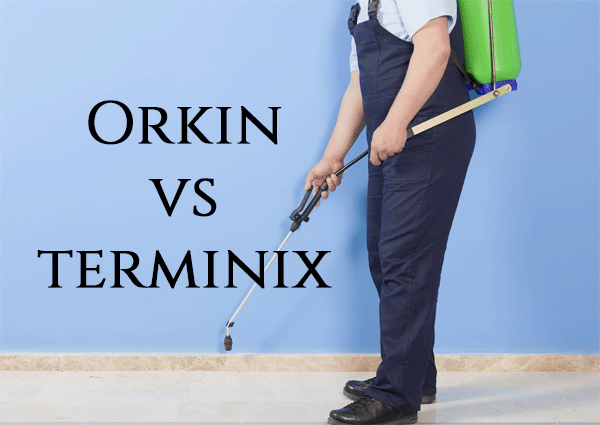 What’s the difference between Orkin Pest Control and Terminix® Pest Control?